Living in student accommodation can be the best time of your life, however, for some it can be an absolute nightmare. Luxury Student Homes has sent over their favourite student accommodation horror stories from students across the UK. In my student house, one of my housemates accidentally set fire to the kitchen. We were the only two people in the house at the time, she was cooking and I was in the shower. She had also taken the batteries out of the smoke alarm a few weeks before because “it always goes off when I am cooking” apparently. So, when she failed to put the fire out it began to spread and then she just left me in the house, did not call 999, she just ran outside and waited for the place to burn down whilst I was completely unaware. Luckily someone who lived in the student accommodation next door called the fire brigade and I managed to escape wearing a towel. The fire damage was not too bad, but we did get charged £200 for not having batteries in the smoke alarm and my housemate refused to pay it! Me and 3 other girls moved into a student house in Manchester which was fine until a few weeks after we moved in, a patch of damp in the kitchen appeared and the landlord was just not interested in doing anything about it. After a few months, the damp got worse and mould had started to grow on it, it looked disgusting and it was embarrassing whenever we brought any friends over. It took months before the landlord would even come and take a look and yet still refused fix it, luckily we did not have long until we could move out which we all did as soon as we could. When I was living in a student house during my 2nd year, one housemate dropped out quite early on in the year so we needed to find someone else to replace him. Eventually, we find a guy from the internet who was interested in the spare room. Everyone got on ok with each other at first however a lot of the time he would not clean up after himself and the mess got worse and worse over the months. It started with a few plates and glasses left in the sink, maybe a jumper or some clothes left in the communal area which is no huge deal but it wasn’t long before dirty plates, glasses, clothes and empty packages where all over the communal living space. Obviously nobody else would clean up after and the regular arguments with him got more heated, so much so that eventually the police had to be involved. Thankfully he was evicted a few weeks later, and the landlord had to get the communal area professionally cleaned. 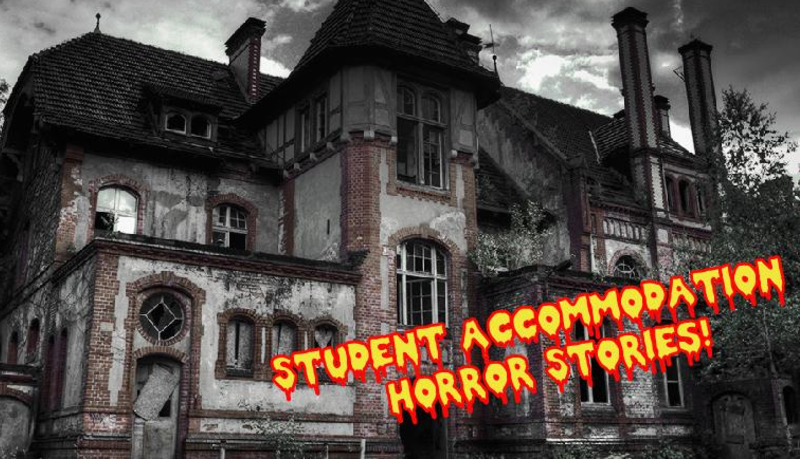 Got any more accommodation horror stories to share? Tell us them in the comments!